It’s YOUR Life! Come make a connection! We are excited to announce the 2019 It’s YOUR Life! 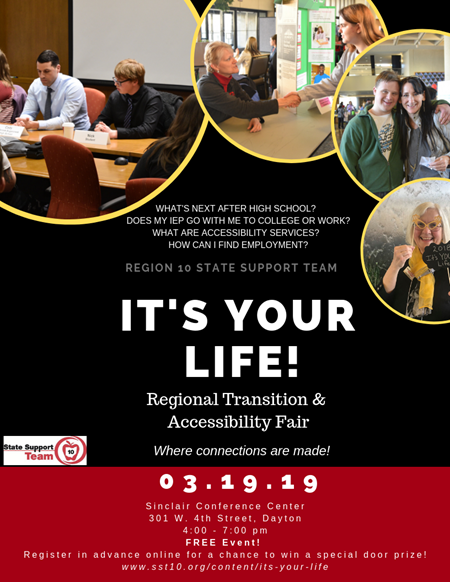 Regional Transition & Accessibility Fair will be held on March 19, 2019 at Sinclair Conference Center in Dayton! This annual event is geared towards the transition from high school to adult life for students with disabilities. There will be area colleges, agencies, and community partners showcasing resources and services, giving students, their families, and educators the opportunity to explore options for education, employment and independent living. In addition, there will be discussion panels, student activities, and door prizes! Mark your calendars for March 19 from 4 to 7 pm and be sure to share this event with your students and their families! We encourage both middle school and high school students, their families, and educators to attend. Advanced registration is encouraged, though not required to attend. Everyone who registers in advance will have the opportunity to win a special door prize. Please visit www.sst10.org/content/its-your-life for details and registration. Be sure to follow our Facebook page for details and updates!